Ford and Honda join scrappage scheme | What Car? Ford and Honda have resolved their dispute with the Government and have confirmed that they will now join the UK scrappage scheme. Ford had stopped deliveries to its dealerships and Honda had told its dealers to suspend registrations for new vehicles under the scheme. The manufacturers had both expressed concerns over VAT payment arrangements. However, Honda has now confirmed it would enter the scheme 'following discussions between industry and Government yesterday and clarification on the finer detail'. 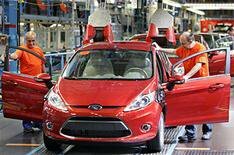 Ford also confirmed it had taken 3000 new orders from first-time customers since the scheme came into effect yesterday. Under the UK scrappage scheme, motorists are offered a 2000 incentive to scrap cars that are over 10 years old, with half the cash paid by the Government and half by the manufacturer.